I blogged about this setup that Lowes had on their site...but then the link vanished. Now it's back! The problem with the green movement is that they (the infamous They) try to make you think you need to spend money on all sorts of expensive crap. You don't. You know who really started the green movement? Poor people. Reuse, recycle, repurpose, gardening, food sharing, conservation of resources...yeah...when you don't have a lot of money, this is all your normal way of life. Don't let people con you into believing you have to be rich to be green. I'm not about to spend a hundred dollars plus for a barrel to hold water. What a crock. 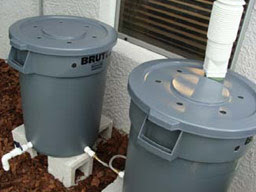 I like Lowes DIY Rain Barrel setup. Although, their old one didn't involve that aerator thing to attach the leader to the garbage can...I think they just cut a hole or something last time. Also...I don't think the overflow holes at the top are the best idea. You don't want water running down around your house. I'd think some tubing of some kind (a hose probably isn't thick enough...maybe more pvc) attached to the top and placed to pour out away from your house is probably a better idea. And definitely mesh on any opening. You don't want mosquitoes getting in. Once I find someone getting rid of some large, preferably heavy duty garbage cans, I'm going to use the leftover pvc I have laying around and build these. I know it has been more than three years since you last posted this. I hope you were able to build your own rain barrel. An ideal rain barrel is large enough to contain the amount of rainfall in your area, does not corrode easily, and is placed in a location that can be easily accessed. On a side note, I agree with your point that the rain barrel must point to a direction away from the house. This will facilitate easier drainage.